Give your usual egg recipe a break and try something different! 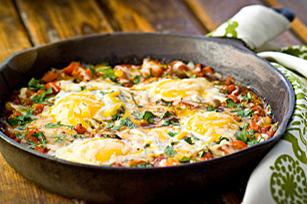 Our Huevos Rancheros recipe makes a delicious egg skillet for four - perfect for a weekend brunch! Heat dressing in large skillet on medium-high heat. Add red peppers, onions and jalapenos; cook and stir 5 min. or until crisp-tender. Add tomatoes; simmer on medium-low heat 2 to 3 min. or until thickened. Break 1 egg into small bowl; gently slip into tomato mixture. Repeat with remaining eggs, keeping eggs separated; cover. Cook 10 min. Remove from heat; uncover. Let stand 2 min. or until whites are completely set and yolks begin to thicken but do not become firm. Serve with warmed whole wheat tortillas, refried beans and chopped avocados. Enjoy a little taste of Mexico with this flavourful recipe. As a bonus, the red pepper provides an excellent source of vitamin C.